So long as the charging system on the Aprilia RST1000 Futura is working correctly, the battery should last well – a good three years at least – and not give trouble. However, many owners have fitted larger capacity batteries that give more cranking power to start the bike easier – they do cost more, however. But then you don’t get nothing for nothing. Also, some are taller than the original, and others shorter. Dimensions appear further down the page but the taller ones will fit if you remove the plastic clamp that sits above the battery, though in some cases you may have to re-drill the lead ends to get them to fit closer. The standard battery fitted to the Futura is made by Yuasa and is 150mm across, 87mm deep and 110mm high. The higher powered batteries only vary in their height. The most important figure is the Cold Cranking Amps, or CCA. The higher the figure, the beefier the cold starting performance. It’s a good idea to shop around, especially as these batteries are also used as standard in the Honda ST1300 Pan European. Some owners have also had success with the MTZ14S, a pattern part. Note: Don’t try and take any short cuts in getting a new battery on your bike. YTZ batteries in particular will never give of their best unless they are fully charged on an Optimate or similar before being used. 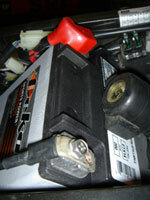 See also the charging system page and the wiring mod page.